Gourmet grain free complete meal for adult dogs. 100% natural with added vitamins. 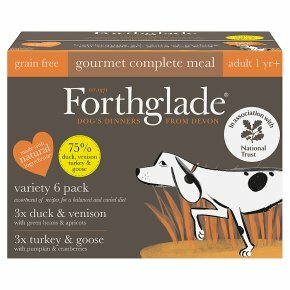 Bursting with goodness Nutritionally balanced - duck, venison, turkey and goose are excellent proteins, easy to digest and highly palatable. Green beans, apricots, pumpkin and cranberries are a brilliant source of essential vitamins packed with minerals, fibre and natural antioxidants. Grain free - we don't add any grains to this recipe, so it's great for dogs with sensitive tummies. Botanicals - natural herbs to help aid the body's natural defences. Minerals, vitamins & prebiotics - with chelated minerals to help improve nutrient absorption, and prebiotics to help support an increase in 'good' gut bacteria. Omega-3 - increased levels of omega-3 fatty acids to help support immunity and encourage a healthy skin and coat. Gently steamed - we add a little water to help cook everything slowly and at a low temperature, to retain all the natural goodness. Daily feeding guide Size: Small; weight: 0-10kg; trays a day: 1/2 to 1 1/4 Size: Medium; weight: 10-25kg; trays a day: 1 1/4 to 1 3/4 Size: Large; weight: 25-40kg; trays a day: 1 3/4 to 2 1/4 Size: Extra Large; weight: 40-70kg; trays a day: 2 1/4 to 3 1/4 A nutritionally complete food that can be fed on its own, simply added to a quality mixer biscuit or used as a tasty topper with dry food. If mixing with other foods please adjust quantities accordingly. When using Forthglade for the first time, introduce it gradually to your dog over five days. It'll take between four to eight weeks to see the benefits. Make sure fresh drinking water is always available.